If you’re looking for one of the best straight razors on the market, look no more! We’ve reviewed the top five straight razors, and have given an in-depth review of each. What Is A Straight Razor? Straight razors are making a comeback. A growing number of men are eschewing modern, multi-blade, disposable, safety razors for the old school straight razors many of their grandfathers used. But choosing and using straight razors can be complex. They require a great deal of practice to avoid accidents with the exposed blade. Plus, there are several things men should consider when they ditch their safety razor or electric razors, and are looking to purchase a straight razor. 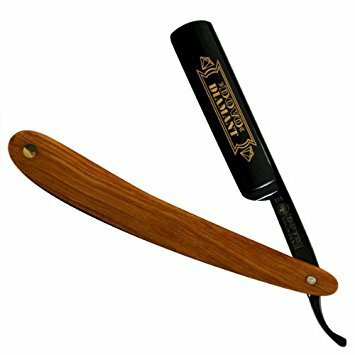 Those things include the blade type, width, temper, material, grind, handle and skill level required for mastering the handling and maneuvering of straight razors to get the clean shave they want. These one-time investments require a small amount of yearly maintenance, but will provide years of enjoyment when taken care of properly. Along with the lower cost and the cleaner shave, using a straight razor feels like a hobby instead of a chore. You get the feeling of using the same tools the old fashioned barbers did, and it’s a man card all on its own. When it comes to using a straight razor, you have to make an initial investment in a quality razor. It’s hard to know which one to choose, and you don’t want to end up with a low quality straight razor for years. 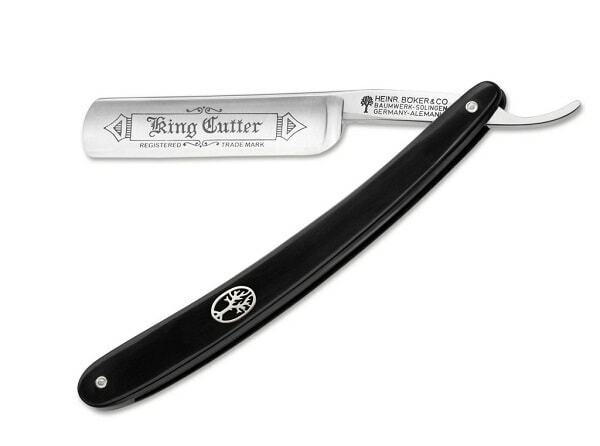 Produced in their Sollingen, Germany facility, Boker boasts of this model as a straight razor with “premium quality straight razor for an affordable price.” The King Cutter shaped razor is 5/8″ and made of an alloy containing silver. When the razor arrived it was sharp and almost shave ready. A bit of stropping was all it needed to give a close shave. The blade is thin and feels almost flimsy in the hand, but that also makes it very maneuverable. The handle seemed light and cheap when I first removed it from the package, but once I started using the razor, I realized that it balances the thin razor very well. Lets take a look at the Parker, which is a crossover between the permanent straight razor and disposable blades. 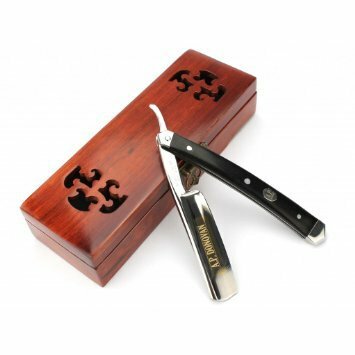 Its stainless steel handle comes with 5 additional disposable blades for the feel of a straight shave with more of the convenience of disposable razors. The feel of this straight blade is excellent, and makes for a clean shave in style. However, at a price that’s pretty cheap, this blade isn’t as high quality as others on the market. The handle seemed to have a design flaw that made closing the blade difficult. It was possible, but took a bit of trying. The blade included has a rounded edge, which helps reduce the chances of accidental cuts, so for those new to straight razor shaving, this is a good option. When it came time to replace the blades, it was difficult to wrestle the old one out. For its low price and safety, I would rate this as a good choice for beginners not ready to make an investment. With a handle of solid sandalwood and a blade made of Japanese tempered steel, the A.P. Donovan includes a strop for immediate use. A stylish box is included to keep the razor safe on your counter top. The company boasts of a close but gentle shave with their sharp steel razor. When it arrived, this razor did not disappoint. The solid wooden handle had a great feel in the hand, and balanced the weight of the blade easily. It gave a close and comfortable shave after a quick stropping. While the blade and handle are of great quality, I would prefer a bit higher quality strop, but it got the job done either way. For its high quality blade, solid wood handle, and included strop, you really can’t go wrong with this brand. Next on the search comes the Dovo “Diamant” with an olivewood handle and a sharp 5/8″ blade coated in a black finish. The blade thickness is recommended for its close shave with easy use. When the razor arrived, it took a few minutes of honing and stropping before it was ready for use, but other customers have stated that theirs was ready out of the box. Once I was ready to use it, the blade was comfortable and effective, giving a close, even shave. The handle balanced the blade very well, but was lighter than shown online. This razor is a definite investment for the true straight shave enthusiast. For its high cost, the razor did not disappoint in its use. However, it wasn’t ready for use straight out of the box, and the wooden handle was slightly different than pictured. This resinated wood handle razor comes with a strong blade made of sus316 stainless steel to resist rust and chemicals. It is further treated to provide a smooth glide across the skin. I was hesitant when I read reviews calling this razor the “Ferrari of razors” and didn’t know if it could live up to the hype. This razor definitely did not disappoint. Well-balanced feel, close shave, and high quality craftsmanship all come together for a great shave experience. The only downside to this razor is the price tag, which is definitely a large investment for most. Carbon steel and stainless steel are the two most common types of metals from which straight razor blades are made. Carbon steel blades are known for their sharp, long-lasting edge and the clean, comfortable shave they deliver. Plus, carbon steel blades are easy to hone and sharpen. However, they are more prone to oxidation and rust easily. Extra care must be taken to ensure they are completely dry and properly oiled after use to maintain their effectiveness and quality. Stainless steel straight razors maintain their sharp edge longer and resist rusting even if not completely dry after each use. However, stainless steel is very hard, so sharpening and honing it takes more time and effort. Plus, it’s heavier and a little more challenging for novices to use. Straight razors come with five different types of points or tips. They are French, Spanish, Barber’s Notch, Square and Round. Each one serves a different purpose. A French point is a quarter circle shape featuring a single sharp point. It’s great for shaving small, hard to reach areas and maneuvering in tight spots. A Spanish point has a concave tip that makes it easy to reach smaller areas. The Barber’s Notch point has a small, well-defined notch at the top. It improves maneuverability around the ears and nose. The square tip has two sharp points for shaving nose hair. The Round tip is the most common type of point. It’s best for beginners because it can minimize accidents from incorrect handling. The blade width is the distance from the blade’s spine to its cutting edge. It’s expressed in eighths of an inch. They usually range in size from 3⁄8 of an inch to 8⁄8 of an inch. The most popular width of blade is 5/8 inch. The wider the blade the more lather it can carry during successive shaving strokes. This increases shaving time while reducing the number of times the blade needs to be rinsed. A narrow blade is lighter and more maneuverable than a wider one and makes it easier to shave under the nose and other tight facial spots. However, a wider blade between 5/8 and 6/8 of an inch is much easier for beginners to handle and more effective for people with heavier beards. People with experience often prefer smaller blades. Tempering is the use of heat to balance a metal’s mechanical properties like hardness strength and ductility. Straight razors come in soft, medium and hard tempers. The right temper is very important to the quality of the shave. A straight razor with a soft temper is easier to sharpen, but loses its edge after a short period of use. A straight razor with a hard temper holds its edge for a long period of time, but is difficult to sharpen. Medium tempered straight razors are moderately easy to sharpen and can hold their edge through several shavings. People new to using straight razors tend to be more comfortable using a soft tempered razor. The blade of straight razors can be ground in two basic ways. They are the concave grind and the wedge grind. The grind of a straight razor determines the shape of the blade between the spine and the cutting edge. Most modern straight razors have a concave grind. It’s called the ‘Barbers’ Choice’. The concave grind makes the blade sharper, lighter and easier to handle. Men with heavy beards and novices tend to choose straight razors with wedge grinds because of their strength and safety. However, while wedge grinds hold their edge for a long time, sharpening them properly can be difficult and tricky. Other types of grinds include extra hollow singing blade, 1/4 hollow, 1/2 hollow and linear wedge. The handle of the straight razor is very important. It helps to provide better control of the blade. 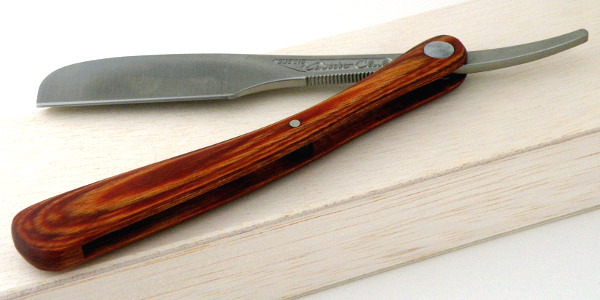 Straight razor handles can be made from a wide variety of materials. They include acrylic, cellulite, plastic, wood, bone, ivory, mother-of-pearl, tortoise shell and more. Each material has its strengths and weaknesses, but it’s important to choose a handle that’s large, solid and balanced enough so controlling the straight razor is easy and comfortable. Many people recommend handles made of bone, cellulite or resin impregnated wooden because they are well balanced, strong, water and heat resistant and don’t deform even with long term, intensive use. One of the most important things to consider before buying a straight razor is your level of skill in handling one. Straight razors are so sharp they are also known as cut-throat razors. It’s essential you know the proper way to handle and maneuver it safely and effectively. Used properly a straight razor can deliver the closest, most amazing shave you’ve ever experienced. However, properly preparing your skin is essential. Invest in good lathers, shaving soaps, pre-shave and post-shave oils and balms and study and practice safe, effective straight razor shaving techniques. Then you’re ready to shop for a straight razor. Out of the five straight razors reviewed the Feather DX with the folding wood handle is definitely the best. Its high quality will not disappoint, and the investment is worth it for a close, clean shave every time. In second place is the A.P. Donovan Professional 7/8″ straight razor which includes a strop. This high quality razor is a great razor within a median price range. 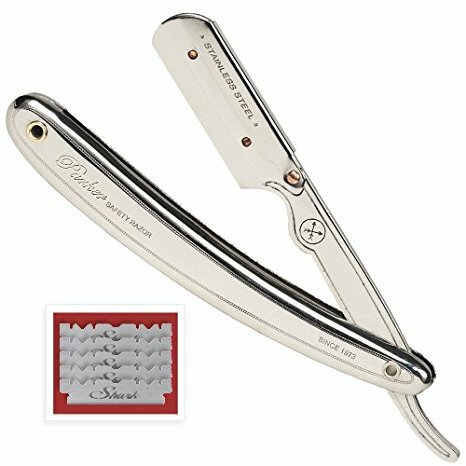 For those looking for the best straight razor for beginners, the Parker SR1 Stainless Steel razor is the best quality with a low price.